The vision of a world safe from nuclear proliferation inspired the work of the Programme for Promoting Nuclear Non-Proliferation (PPNN); an international initiative co-founded in March 1987 by Ben Sanders (based in New York) and John Simpson, Director of the Mountbatten Centre for International Studies (MCIS) at the University of Southampton. The records of the PPNN are now held by the University’s Special Collections department in collection MS424; they represent a unique and rich resource for students concerned with both the history and theory of nuclear non-proliferation. In the first year of its operation the PPNN was funded through a grant from the University of Southampton as well as through charitable donations from the Rockefeller Brothers Fund; the Ford Foundation and the John D. and Catherine T. MacArthur Foundation in the USA and the Barrow and Geraldine S. Cadbury Trust in the UK. 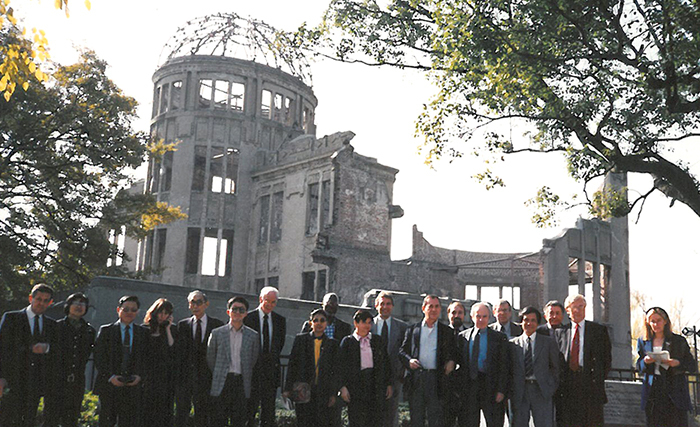 Many other organizations supported the work of the PPNN over the ensuing years as it sought to promote nuclear non-proliferation through three distinct activities. 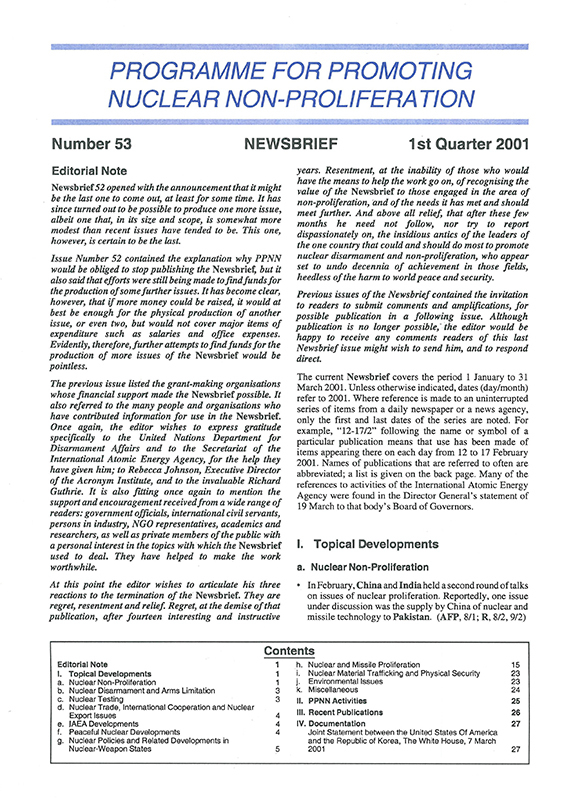 The first of these involved reporting on the evolving non-proliferation situation through a range of publications including: quarterly ‘Newsbriefs’ from March 1988 until 2001; Briefing Books: Volume 1 – The Evolution of the Nuclear Non-Proliferation Regime and Volume 2 – Treaties, Agreements and Other Relevant Documents (published in several editions over the years); annual Issue Reviews; as well as a series of Occasional Papers and Studies. These publications were disseminated to a wide international audience of academic researchers, non-governmental groups, civil servants, parliamentarians and the press in order to reinforce awareness of the global non-proliferation situation. The second activity of the PPNN took the form of a series of biennial meetings held from June 1987 onwards for a Core Group of experts. Academics from a range of backgrounds in nations both East and West and North and South met to discuss the non-proliferation situation. These meetings were often attended by staff of the United Nations and the International Atomic Energy Agency (IAEA). The third objective of the PPNN involved briefing the diplomatic community as part of the review process for the Treaty on the Non-Proliferation of Nuclear Weapons (NPT), which came into force in 1970. The three main objectives of this Treaty are: preventing the further spread of nuclear weapons technology; promoting the peaceful uses of nuclear energy and working towards nuclear and general disarmament. The NPT comes under review every five years, was indefinitely extended in 1995 and is regarded as the centerpiece of the international non-proliferation regime. 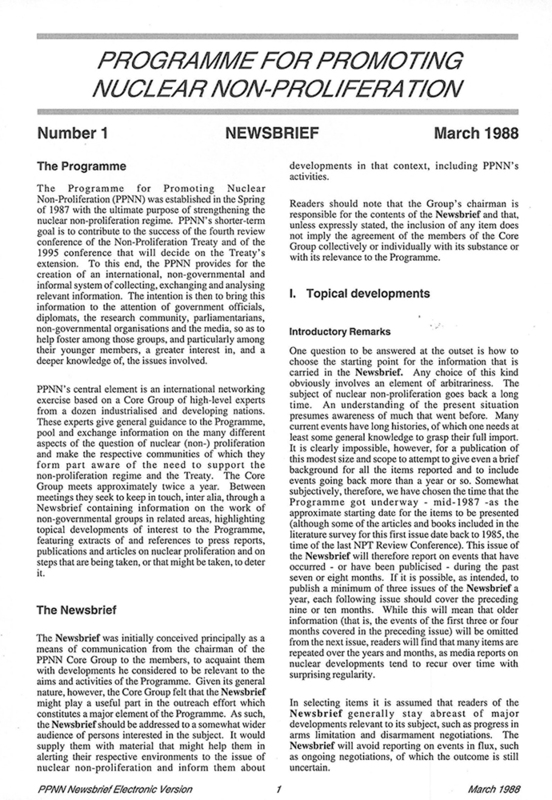 Indeed, the PPNN was established in the spring of 1987 with the following remit: “The specific aim of the Programme is therefore to assist in ensuring that the NPT Review Conference in 1990 and Extension Conference in 1995 have successful outcomes.” [MS424 A3079/2/1/2/2]. Since the dawn of the atomic age in July 1945, when the USA exploded the world’s first atomic weapon, it may appear that an inevitable march towards ever greater nuclear weapons proliferation has taken place over the decades. Since that time, nine other countries have developed their own nuclear weapons capabilities and made their first test explosions in the years as follows: USSR/Russia (1949); the UK (1952); France (1960); China (1964); India (1974); Pakistan (1998) and North Korea (2006). Israel has maintained a policy of deliberate ambiguity concerning its nuclear weapons programme but had probably developed its own capability by the mid-late 1960s. South Africa acknowledged in the early 1990s that it had developed a nuclear weapons capability around 1979, but then subsequently dismantled its own programme. The NPT could, therefore, be judged pessimistically as having failed to prevent the continued proliferation of nuclear weapons since 1970; given that India, Pakistan and North Korea have since emerged as nuclear powers. But prior to the NPT’s arrival many experts assumed that the number of nuclear weapons states would increase by orders of magnitude as the technical know-how of nuclear weapons technology proliferated throughout the world. As many as twenty other countries that were actively planning or considering their own nuclear arsenals either chose not to pursue them or were thwarted in their clandestine attempts to do so; in part due to restrictions imposed by the NPT, military intervention and other mechanisms of the international community. The aims of the NPT (and by extension the PPNN) in preventing the further proliferation of nuclear weapons must, therefore, be judged as a relative success. According to Article VI of the Treaty: “Each of the Parties to the Treaty undertakes to pursue negotiations in good faith on effective measures relating to cessation of the nuclear arms race at an early date and to nuclear disarmament, and on a treaty on general and complete disarmament under strict and effective international control”. Although the number of nuclear weapons in the world peaked during the middle years of the 1980s at approximately 70,000, there still exist in excess of 15,000 nuclear weapons at various stages of readiness. Total nuclear or general disarmament has, therefore, failed to materialise after many decades and the NNWS (Non-Nuclear Weapons States) have criticised this state of affairs as a kind of continuing ‘nuclear apartheid’ between the nuclear ‘haves’ and ‘have-nots’. Indeed, it was the perceived lack of progress by the NWS (Nuclear Weapons States) in moving towards nuclear disarmament which prevented a substantive Final Declaration from being reached at the NPT review conference held in 1990, which also concluded Phase I of the PPNN’s activities. Phase II began in 1991 and continued the PPNN’s work until the NPT Review and Extension conference of 1995, which was successful insofar as it was agreed to extend the NPT indefinitely, 25 years after its entry into force. Success in 1995 was reached in part through a general agreement amongst states to move towards a treaty banning all nuclear test explosions, adopted by the UN the following year. 2016 therefore marks twenty years since the United Nations General Assembly adopted the Comprehensive Nuclear Test Ban Treaty (CTBT) on 10th September 1996 and since this time only India and Pakistan (in 1998) and North Korea (on several instances from 2006 onwards) are known to have conducted nuclear test explosions. Paradoxically, it was after the success of the NPT’s indefinite extension in 1995 that the charitable funding the PPNN had come to rely on began to decline. 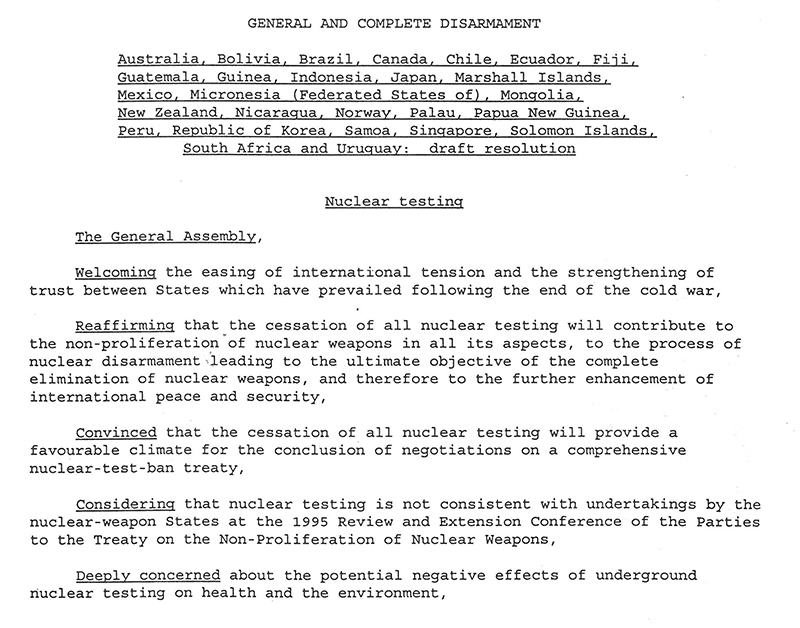 Phase III ran from 1996 until the NPT Review Conference in 2000 and expanded the PPNN’s remit to focus on “…ways through which the ultimate goal of the NPT might be achieved: the total elimination of nuclear weapons.” [MS424 A3079/2/1/9/1]. The 2000 NPT Review Conference culminated with an agreement amongst the NWS to de-target their nuclear missiles, pointing them away from each other’s territory, marking a departure from the open hostilities of the Cold War. In April 2000 the PPNN launched the Mountbatten Centre International Missile Forum (MCIMF) which sought to ‘assist, promote and advance the current international efforts to develop norms and legal instruments for combating missile proliferation’ [A3079/2/1/10/1]. Given all these developments, in which the PPNN played a small but worthy role, the story of the non-proliferation movement has been one of incremental and relative success: from the limited proliferation to new states of the weapons themselves since 1970; the overall reduction in their numbers from the 1980s; the decline of weapons-testing since the 1990s; and the reduced role that nuclear weapons now play in the defence strategies of the NWS due to reduced Cold War enmities. All of these successes, however, seem somehow overshadowed by the failure of the world to move towards complete nuclear disarmament as envisioned in those lofty commitments of the UN General Assembly’s first resolution back in 1946 and echoed a generation later by the NPT in 1970. Why has total nuclear disarmament failed to materialise? The answer can be found in the complicated tension between the awful and inhumane destructive power of nuclear weapons and the perceived right of a nation to possess them as an ultimate deterrent against aggression, which was encapsulated twenty years ago on 8th July 1996 by the International Court of Justice (ICJ) in its advisory opinion: “…the threat or use of nuclear weapons would generally be contrary to the rules of international law applicable in armed conflict, and in particular the principles and rules of humanitarian law; However, in view of the current state of international law, and of the elements of fact at its disposal, the Court cannot conclude definitively whether the threat or use of nuclear weapons would be lawful or unlawful in an extreme circumstance of self-defense, in which the very survival of a State would be at stake.” Twenty years later the deterrent debate rages on without resolution; posing the most serious barrier to total nuclear disarmament. Special Collections also holds the collection MS 355 Papers of Milton Leitenberg, relating to nuclear non-proliferation. This entry was posted in Manuscript Collections, War and warfare and tagged International Day for the Total Elimination of Nuclear Weapons, Mountbatten Centre for International Studies, Nuclear deterrents, Nuclear weapons, PPNN, Programme for Promoting Nuclear Non-Proliferation, United Nations. Bookmark the permalink.